An artist's concept of twisted space-time around Earth. Let's a take a peek into the mind of a true gravitational master. Einstein's first insight into the nature of gravity was to put a new twist on an old idea. In Isaac Newton's original mathematical description of gravity ("OG"? ), there's an odd coincidence when it comes to the concept of "mass." In one famous equation, F = ma, mass is your inertia — how much oomph it takes to shove you along. In Newton's other equation on gravity, mass is more like gravitational charge — the level of attraction you might feel toward the Earth, for example. Objects with twice the mass feel twice the attraction toward the Earth, and should therefore fall twice as quickly. But years back, Galileo Galilei had conclusively shown that they don't: Neglecting air resistance, all objects fall at the same rate regardless of their mass. Thus for Newton's theory to work, inertial mass had to be the same as gravitational mass, but only by sheer coincidence: there was no reason for this equality to hold. For an object with twice the mass, the Earth may pull on it twice as strongly, but this is perfectly canceled out by the fact that it's now twice as hard to get the object moving. Inertial and gravitational masses move in perfect lockstep. This odd correspondence had long been a puzzle in gravitational circles, but in 1907, Einstein took it one step further. The physicist imagined what would happen if you were to fall from a great height. Again neglecting air resistance, your inertial and gravitational masses would cancel, making you feel perfectly weightless, as if there were no gravity at all. But zero-gravity environments are precisely the playground of Special Relativity, the theory he had cooked up just a couple years prior that wove our conceptions of space and time into the unified fabric of spacetime. To Einstein, this was a major clue. Lurking in the shadows of gravity was his precious special relativity and the essential concept of space-time, and what made that realization possible was the elevation of the equivalence between inertial and gravitational masses into a fundamental principle, rather than the awkward afterthought it had been. Then, Einstein took it another step further. Suppose that in the middle of the night, we relocated your bedroom to the interior of a rocket, launched the craft into space (you're a heavy sleeper) and sent it flying away with the engines purring, providing a constant 1 g acceleration, the same acceleration you would feel on the Earth. Let's further assume that the rocket is perfectly quiet, so there's no immediate giveaway that you're on that spaceship. Unless you looked outside and noticed that only a worryingly thin piece of glass separated you from the vacuum of space, you would have no idea that you were part of some grotesque science experiment. Drop an apple — it falls to the floor. Drop a jug of milk — it falls to the floor at the exact same rate. From outside the spaceship, it's easy to see why: The apple and milk aren't really moving, but the rocket is accelerating forward, "meeting" the dropped items. If we removed the floor altogether, the apple and milk would simply stay put as the rocket zoomed away. But inside the rocket ,you would just think it's normal gravity: Objects are falling, as they are wont to do, and all at the same rate. The implication is clear (or at least, it was clear to Einstein): Gravity causes acceleration, and acceleration causes gravity. They are absolutely identical. Einstein had to make one more big leap to get us to modern gravity. It's such a big leap that he spent five years just tinkering around with the implications of gravity = acceleration before he could make the next jump. And to do it, you could almost say, he had to think in circles. Imagine a specially designed merry-go-round, with all the horses lined up nose to tail, forming a perfect circle around the perimeter. Now, accelerate the ride such that it's rotating at close to the speed of light. What happens? Let's assume, first of all, that the ride can actually stay together. As the horses pass in front of your view, they appear shorter. Why? 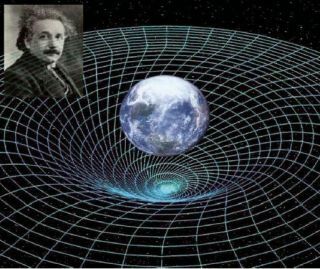 At those speeds, Einstein's special relativity teaches us that moving objects contract along their direction of motion. That means the horses aren't perfectly nose-to-tail anymore; you can squeeze more seats into a rotating ride than you could in a stationary one. But the total width of the ride hasn't changed; the entire ride isn't powering across your field of view, so you don’t observe any relativistic length-contraction funny business to the entire structure, just to the horses as they pass by. This combination means that our old familiar relationship between diameter and circumference (C = pi * d) no longer applies to the rotating ride. The geometry that describes this relationship simply isn't the normal Euclid-derived stuff that we were taught in high school. It's non-Euclidean, or the geometry of curved spaces. So here are the puzzle pieces that Einstein had in 1912: a) Space-time must be involved somehow, b) acceleration and gravity are intimately linked, and c) some accelerations need to be described by curved geometries. While it's easy enough for us, a hundred years later, to simply say, "Gravity is the curvature of space-time," it took Einstein another two years of feverish work to make all the mathematical pieces fit and give us what we know as general relativity. Learn more by listening to the episode "Seriously, What Is Gravity? (Part 1)" on the "Ask A Spaceman" podcast, available on iTunes and on the web at http://www.askaspaceman.com. Thanks to Andrew P., Joyce S., @Luft08, Ben W., Ter B., Colin E., Christopher F., Maria A., Brett K., bryguytheflyguy, @MarkRiepe, Kenneth L., Allison K., Phil B. and @shrenic_shah for the questions that led to this piece! Ask your own question on Twitter using #AskASpaceman or by following Paul@PaulMattSutter and facebook.com/PaulMattSutter. Follow us @Spacedotcom, Facebook and Google+. Original article on Space.com.